Please click the “Give Now” button below to make donations such as your monthly contribution to our “Ministry Plan” (FUMC’s primary budget), gifts to FUMC classes, or a specific ministry fund. Or text FUMCAUSTIN (all caps) to 73256 on your smartphone and follow the prompts. Once your number is registered, future gifts are easier to make. Each time an individual unites with our congregation, we reaffirm that commitment. All of these−prayers, presence, gifts, service, and witness−involve giving of ourselves and our resources. God calls each of us to share in the ministry of giving. You will find described here a few of the most effective ways to support Christ’s church through your gifts. Growth in Christ begins with putting God first in our lives. One very significant way to grow in grace and love is to put God first in the stewardship of our money, pledging each month to give “off the top” to God’s work through the Church. Throughout the long tradition of God’s community, it has not been a fixed amount by which we plan our growth in stewardship; rather, it is the TITHE, a definite proportion of one-tenth of our income, that stands as the traditional minimum gift given back to God out of what we have received. Your financial generosity enables all of our ministries to answer God’s call effectively. Sharing with the church your prayerful decision to be generous makes it possible for us to confidently make and implement bold plans for effective ministry. Gifts express the love we have for others. At First Church, members have found many ways to honor their loved ones, including gifts to our missionaries and other mission causes. Memorial gifts honor the memory of loved ones who have died, expressing this love through the ongoing life of Christ’s church. Below are options available to honor a loved one with a gift. To donate, please choose the select ministry fund online at our Online Giving page and write the the person you are honoring in the notes. For questions, contact Laurie Barr at laurie@fumcaustin.org or 512-478-5684 (ext. 202). The people who are First Church have established the First United Methodist Church of Austin Endowment Fund as a trust for tomorrow. 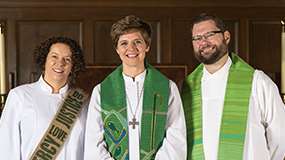 It is a method whereby today’s church can help to assure that tomorrow there will be a United Methodist church serving downtown Austin to meet the needs of tomorrow’s world. Those who give to this fund give thanks to God for blessings bestowed, express their devotion to Christ and to his church, and honor loved ones whose lives have served as inspiration. May future generations realize that the trust they have inherited from those who have walked before carries with it the charge to serve God in this place in such a way that his kingdom may come upon the earth. To discuss the variety of ways you may participate in the church’s ministry of giving, speak with one of the pastors. For more information concerning the Endowment Fund, memorial gifts and other giving opportunities, contact our church administrator at 512-478-5684. 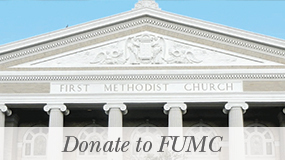 Did you know that you can help donate dollars to FUMC by shopping at Amazon and Randall’s? FUMC has an affiliate account with Amazon and as long as you purchase through the link www.amazon.com/?tag=fumcaustinorg-20, Amazon will automatically credit the church 3-8% of your purchase. Please bookmark this link and use it for all of your Amazon purchases regardless of account login. If you shop at Randall’s, talk to customer service about adding FUMC to your Randall’s card (#8030) for their Good Neighbor program. 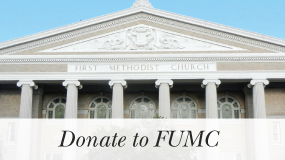 By shopping, you can help FUMC fund new programs!